Mid sized rear wheel drive. 18" x 16" seat will comfortably accommodate up to a 20" x 18" requirement. Programmable VR2 controller with adjustable joystick mount. 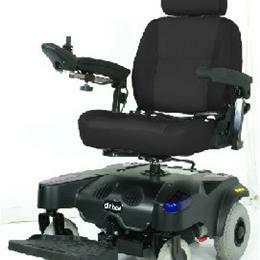 Swivel and reclining captains seat with adjustable head rest. Adjustable up to 50° reclining back angle. Padded armrests are flip back, height, angle, width and depth adjustable. Seat post mounted seat that swivels 90 degrees. 4 AMP, fan cooled, off board charger. Available in three attractive colors; blue, red, and gold. Adjustable height, angle and depth footplate. Flat free tires provide security and a comfortable ride. Has been tested and surpassed the ANSI RESNA testing requirements. Comes with batteries. (U1 34 AMP batteries). Brackets (ECELR-P or SFELR) for front riggings (STDELR-TF or STDSF-TF) all sold separately.